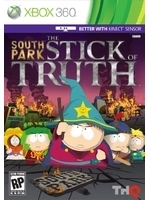 Ubisoft announced that the Obsidian-developed South Park: The Stick of Truth game will hit PlayStation 4 and Xbox One on Feburary 13th for $29.99. Since Ubisoft has been in the mood for releasing remasters lately, it would be nice if they did one for the Tom Clancy's Splinter Cell games or just Blacklist, an excellent game that didn't sell well enough the first time, but now with more and more people knowing how great it is, it would help bring attention to the franchise - specially since Ubisoft has said they're already working on a new Splinter Cell game. Another franchise that could take some remastering is the Prince of Persia Sands of Time trilogy. It would take more effort, but there's the PC versions who already have much better assets than the ones on consoles. Plus Ubisoft has already made many remasters where they had to do that. These would help gather more attention and create new fans of these franchises. Its been available for a while if you purchased TFBW, I guess this is just the solo release. The 360 version was already backward compatible on Xbox One (and you could buy it for 20 bucks or less). Dunno why they are bothering. Is this version going to fix the horrible stuttering of the original?